Dr. Avtar Sehra is CEO and chief architect at Nivaura, a startup aiming to bring blockchain and distributed ledger efficiencies to financial services. In this opinion piece, Sehra explores the emerging markets being built upon cryptocurrencies, shedding light on important aspects of the underlying structural and dynamic economics of ICOs. The market for initial coin offerings (ICOs) is a novel and complex phenomenon wherein projects issue blockchain-based transferable assets known as “tokens” to the public in return for payment in a cryptocurrency. One of the most obvious use cases for such ICO token issuances is to represent some form of traditional security – e.g. equity, debt, participation in profit sharing. However, since the “offer and sale” of securities is highly regulated, several models have been devised by startups to enable ICO distribution models without falling afoul of securities regulations. This alternative asset class – known as “appcoins” – enables holders to access a product or service at some preferential commercial arrangement (e.g. discounted price or exclusive access), and the tokens can be traded on an open market. The U.S. Securities and Exchange Commision (SEC) recently issued an investigative report cautioning market participants that the offer and sale of digital tokens by “virtual” organizations may be subject to the requirements of federal securities laws, also noting that potential classifications of tokens as a securities will be assessed on a case-by-case basis and will relate to the facts and circumstances, including the economic realities of the transaction. Despite the SEC’s stance, though, it is still not entirely clear what the boundaries are for token issuances in general both in the U.S. and globally, as such cryptocurrencies and ICOs remain the “Wild West” of financial services, where value is being created through regulatory arbitrage, and more could be at stake now than during the development of the World Wide Web. Gambling was illegal in Japan prior to 2016. Until then, exceptions existed such as horse, boat, motorcycle and bicycle racing and lotteries. Nevertheless, over the years determined entrepreneurs found simple yet effective methods to bypass Japan’s gambling laws. One of the most popular methods was utilized by parlors operating the pinball-style arcade game known as pachinko. 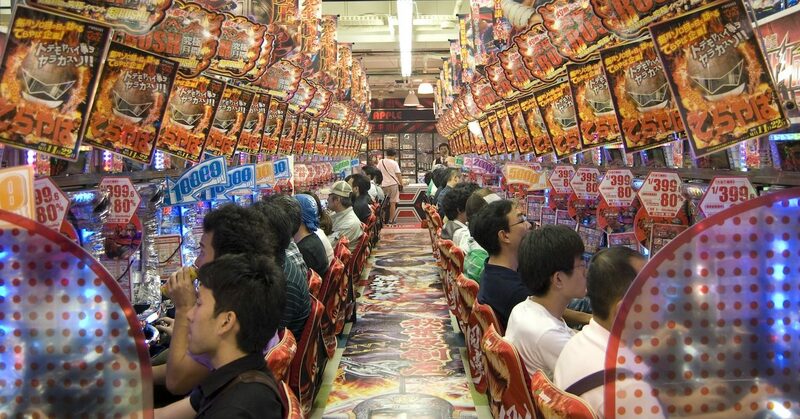 Whilst almost unheard of outside of Japan, pachinko caused the emergence of a thriving gambling market within Japan with approximately 11,000 pachinko parlors nationwide generating gross revenues of $209 billion in 2015, approximately 4–5 percent of Japan’s GDP. Players participate by purchasing small metal “pachinko balls,” then load these into a pachinko machine and operate a lever mechanism that deposits the balls at the top of the machine. There the balls lose momentum and fall into a playing field littered with obstacles and targets. Hitting targets yields returns in the form of more balls. The balls themselves have little intrinsic value as they belong to the gaming parlor. However, once players decide to call it quits, they take their remaining balls (including extra balls won) to a prize booth in the parlor where they exchange these for prizes. Now this is where it gets interesting. As the pachinko parlor is forbidden by law from awarding cash prizes, it gives a “cash equivalent prize” in return for the pachinko balls the player returns. However, the pachinko parlors have an associated, but normally separate, independent business located outside the parlor that “buys” the prizes for cash! This effectively makes the balls and prizes a mere promise for cash. Pachinko parlors have built a thriving gaming (and closet gambling) industry operating subtly yet effectively in plain sight. Pachinko’s market size shows there is either huge demand for this type of game, or that it is a substitute for the simple and unadulterated concept of casino style gambling. The key question is which is it? The legalization of casino style gambling in Japan stemmed from the government recognizing the opportunity to tax the sizable gambling market, increase tourism and stimulate economic growth. These new laws are likely to encourage the gambling market to expand as casinos start providing a greater variety of gaming to satisfy a wider range of customer interests. Pachinko’s market share will likely decrease as demand shifts toward a casino model of gambling. However, there is also a strong possibility that contrived business models, like those used by pachinko parlors, will adjust to increase their appeal in the new gambling environment. The construction of these “workarounds” that leverage regulatory arbitrage opportunities to execute undercover securities issuances, may be limiting the vision and creativity required to see the true scale of what ICOs and digital tokens could represent; blinding many in the industry to possible risks if they take the wrong path. However, there is significant complexity in understanding the boundaries where a token goes from being a “simple” appcoin to a security. In any event, an ICO participant’s expected returns may be seen as linked directly to the pooled funds of the ICO and the efforts of the issuer to use those funds to execute its proposed plans to generate returns – i.e. participants are buying into the ongoing commercial proposition. Due to such complex economic realities of ICOs and the resulting appcoins, it becomes increasingly difficult to distinguish coins with these rights from analogous existing structures which are long established forms of securities. If analyzed correctly, how can a token issued with attendant voting rights, rights to benefits and potential involvement in management decisions, be any different from an equity security? This is the key questions that needs to be answered by issuers of an appcoin. While greater application of existing or even new regulation will increase the complexities and costs of token issuances, it is also likely to open this asset class to new categories of investors, and therefore a deeper pool of capital. As a result the industry could see more regulated trading platforms emerge on which tokens can be traded from issuance and in the secondary market. Therefore, greater regulatory oversight of the ICO process may elicit the true benefits of appcoin type tokens, which could accelerate the refinement of real use-cases rather than just being mechanisms for bypassing regulatory burdens. This may lead to appcoins becoming an asset class in of themselves, requiring significantly different approaches to risk management and investor protection. Considering the highlighted risks, more suitable models need to be built to account for the economic complexities of issuing and managing tokens. This can be viewed in two ways: firstly from the structural properties related to token issuances themselves; secondly from the overall market dynamics impacting efficiency and stability. Structural properties can be considered in terms of monetary policy – i.e. token scarcity managed with a supply cap and controlled release;, and a more novel concept of “Fiscal Policy,” meaning commercial benefits for token holders, such as exclusive or discounted access. 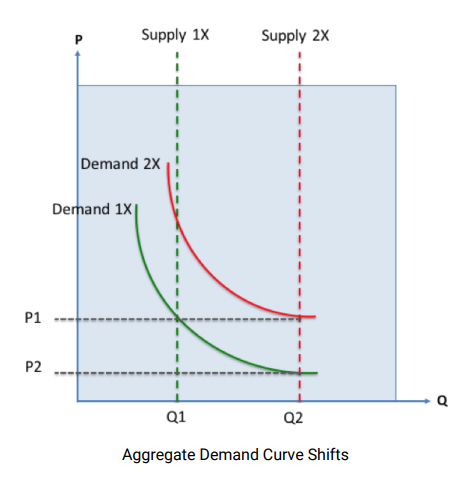 For example, an issuer could make a fiscal policy proposal to increase the commercial benefit of the tokens, leading to an increase in aggregate demand of the tokens (from Demand 1X to Demand 2X in diagram below). This action could be combined with a monetary policy decision such as releasing tokens that may be held in escrow, thereby increasing the total supply in circulation (from Supply 1X to Supply 2X in diagram below). From an overall market perspective, key aspects around information asymmetry and crowd behaviour can also be assessed to build a mental model for market dynamics. One of the key points is based on the foundational view of how effective crowds operate. Efficient markets are “good” social networks, but not all good social networks are efficient markets. This stems from the view that, while social networks can drive efficiencies in unimpeded transmission of information and establishing trust to facilitate trade, badly incentivized social influencers who dominate the dissemination of biased and skewed information can undermine the wisdom of crowds. Experimental evidence shows that social influence effects can diminish the diversity and independence of a crowd, thus skewing the statistical aggregate and deteriorating the resulting collective wisdom of the crowd. behavior. Such scenarios can result in a case of “adverse selection” that is shown to increase chances of market instability. While we may not have the benefits of the pachinko parlor industry to look outside our little bubble and see what is possible, we have our imagination, logic and intellectual honesty. Many are trying hard to believe and convince others that ICOs are just like reward based crowdfunding or software licences in order to distance the issued tokens from financial securities, only for the purposes of abstracting legal and regulatory burdens.